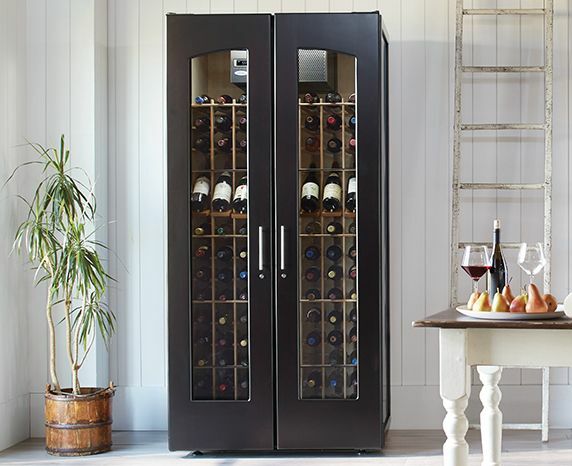 Selecting a piece of furniture for your home is tricky enough—but a refrigerated wine cabinet adds another set of considerations to the mix. Are you thinking of purchasing a Le Cache cabinet? We've boiled the decision process down to 3 simple questions. How many bottles do you want to store? Each capacity listed above is a total capacity, the maximum amount of bottles that a cabinet can safely hold. Our cabinets include individual, double-deep wood racking for holding the majority of bottles, as well as some bulk storage space above the racking. For a more detailed breakdown of capacities (racked versus bulk), see our bottle capacity sizing chart. As you choose a size, we recommend that you overestimate the number of bottles you plan on storing, in order to leave room for your collection to grow. If you have the space and the budget, it's better to have excess space in your cabinet than not enough. Which style of cabinet best suits your decor? Your answer to this question is ultimately a matter of taste. At Le Cache, we make cabinets in 5 main styles to blend with many different interior decorating schemes. Contemporary – Harmonious, clean lines and sleek accents make this style our most versatile. European Country – Crown moldings and luxurious details, inspired by classic Continental furnishings, make this our most formal and sophisticated style. Mission – Delicate wood grains and distinctive mullions recapture the beauty of traditional Arts & Crafts furniture. Carolina – Distressed wood, 3-panel doors and simple moldings evoke a casual elegance. Loft – A minimalist look with brushed aluminum finishes, designed especially for apartments and homes with a modern flair. We offer a choice of 3 sumptuous wood finishes—Provincial Cherry, Classic Cherry and Chocolate Cherry—on most of our wine cabinets. We realize that it can be hard to make a choice without seeing and touching these finishes in person. To help you decide, we offer free wood finish samples, which you can request on our sales inquiries form. You're also welcome to see Le Cache wine cabinets in restaurants near you or visit an authorized Le Cache dealer who carries our cabinets in stock. Where do you plan on placing your cabinet? Each Le Cache cabinet comes with your choice of a CellarPro 1800 Series cooling unit, engineered to provide ideal temperature and humidity conditions for long-term wine storage and aging. You can also specify whether you'd prefer a top- or rear-vented cooling unit. The type of exhaust determines where you can place the cabinet and how it can be positioned. Unless otherwise specified, the cooling unit's hot air exhaust will exit from the top of the cabinet (except for credenzas). Assuming you have sufficient space above and to the sides of the cabinet, the fresh air intake also will come from the top of the cabinet. Otherwise, we'll configure your unit to draw fresh air from the rear of the cabinet. Do you plan on placing your cabinet directly against a wall? If so, choose a cooling unit with top-vented exhaust—and make sure that there is sufficient space above your cabinet. Le Cache cabinets in styles without crown moldings (Contemporary, Loft, and Vault) require 18 inches of clearance between the top of the cabinet and the ceiling. However, cabinets with crown moldings (European Country, Mission, and Carolina) require 12 inches of clearance. If your ceilings aren't high enough to provide the clearance necessary for a top-vented cooling unit, you can choose a rear-vented cooling unit. In that case, you'll need to leave 3 to 4 inches of space between your wine cabinet and the wall. You should not put any style of cabinet in an enclosed space, alcove, or closet without adding our front-vent hood. Read our full space-related placement requirements for more information. Another factor to bear in mind is the environment. If you intend to put your cabinet in a garage, basement, or any environment exposed to a wide temperature range, you should consider our rugged 3100 Vault cabinet. This model has insulated, paneled doors instead of glass ones to better protect your wine in tough environments. Questions about our cabinets? Need help making a purchase decision? Call one of our expert representatives toll-free at 1.877.532.2243 or ask us through a live online chat. You can also use our contact form. We're glad to discuss your wine storage needs.